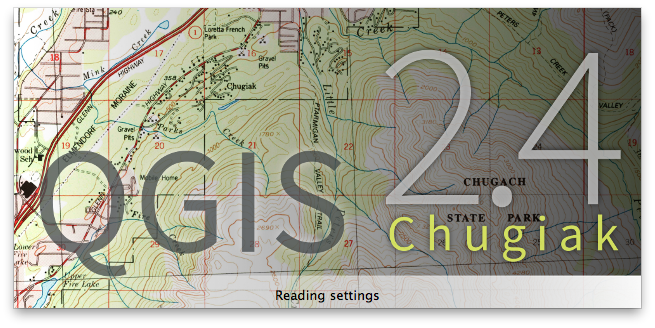 Today I finally found some breathing room in my projects to dare updating my MacBook Pro (running MacOS X 10.9.4 Mavericks) from QGIS 2.0 (Dufour) to the recently released version 2.4 (Chugiak). Well, to be honest I also realized that I should update to be able to use the QgsFeatureRequest.setFilterExpression() method to make use of filtering expressions (introduced in version 2.2). The first step was to download the installer images for QGIS 2.4 and GDAL 1.11 from KyngChaos. The GDAL disk image contains not only the complete GDAL framework (including the GEOS, PROJ, SQLite and UnixImageIO frameworks), but also NumPy. Since version 1.6.2-1 is dated from end of August 2012 I decided to skip installing, since I installed my NumPy later than that and should therefore be up to date already. The GDAL installation worked without a problem. Next step was the installation of the actual QGIS 2.4. The readme files recommend to delete any existing QGIS.app file from the Applications folder, so that’s what I did. 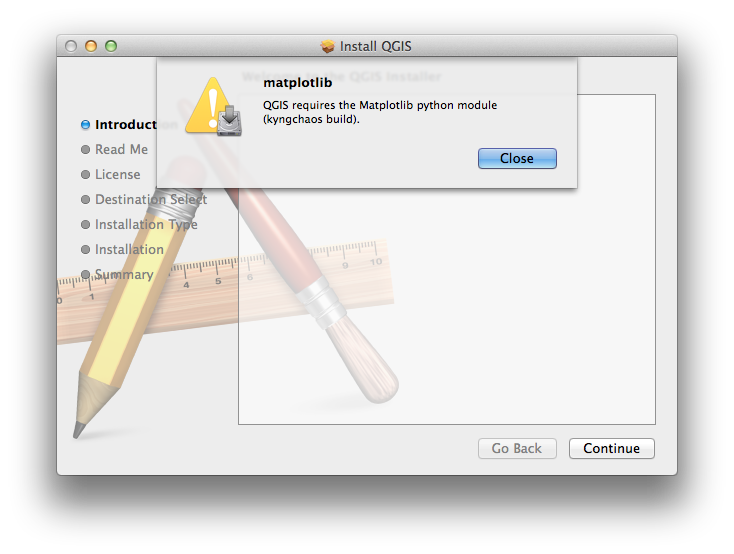 The installer then confronted me with this error message: "QGIS requires the Matplotlib python module (kyngchaos build)." Luckily matplotlib 1.3.1-2 from early 2014 can also be found on the KyngChaos website, so I installed that from the disk image (root authorization necessary) and went back to the QGIS installer. When the installer presented me the readme file once again I realized that I had apparently just read over the hint that not only NumPy but also the matplotlib python module was required – classic user error on my end! The QGIS installer also requires root authorization, takes few minutes and about half a gigabyte of hard disk space. After the small hickups earlier it finished without a problem, and I was presented first with the beautiful new splash screen and then the GUI itself. 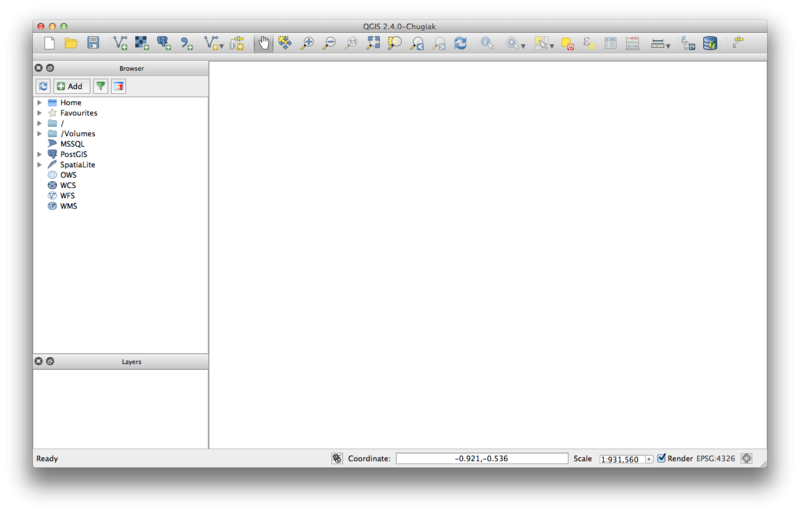 Side note: I love the fact that QGIS remembered all my settings regarding toolbars, window locations etc.! Huge thanks and props have to go to the team behind QGIS – I can’t wait to look for reasons to try out all the new features. For a quick overview I can recommend Nyall Dawsons blog, whose most recent blog articles provide both an overview of and also some details about what’s new in QGIS 2.4. OK, here’s a caveat to be kept in mind when updating to QGIS 2.4: the OpenLayers plugin is currently not compatible with the 2.4 release! Therefore you not only can’t use it to add OSM, Google, Bing, or other popular web maps to your projects, but you also won’t be able to load any QPS project files that try to load such a layer using the OpenLayers plugin! The only way around this would be to load the project in question on another machine in an older QGIS version, or (as I did) to manually edit the QPS project file to remove the layer. Just make sure you don’t forget a single reference! In my case I had not only to remove the corresponding <legendlayer> block in the <legend> block, but also the corresponding <maplayer> block in the <projectlayers> block, and the layercount attribute in said <projectlayers> block. I am also using KyngChaos QGIS 2.4 but I have a problem… When I try to install a plugin the repository always shows as offline (but it shows online in a windows computer in the same network at the same time). What could be wrong? Thank you. That sounds weird indeed. Have you tried turning it off and on again? (apologies for the random IT Crowd reference…) In all seriousness, have you tried using a different repository? You can select the plugin repository from Plugins > Manage and Install Plugins... > Settings. There’s a list of repos here: http://hub.qgis.org/projects/quantum-gis/wiki/Python_Plugin_Repositories. Let us know how it went!